The HSAP assesses students in South Carolina for English language arts and mathematics skills. Increase Your Score on the HSAP! Winning multiple choice strategies for the High School Assessment Exam! Winning multiple choice strategies for the High School Assessment Exam. 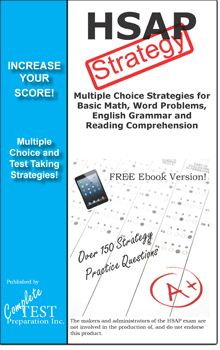 Learn and practice multiple choice strategies for reading comprehension, basic math and English grammar. Over 150 strategy practice questions with extensive commentary. Also includes how to take a test, and how to prepare for a test! Includes FREE ebook version suitable for iPad, iPhone, any tablet or smartphone!